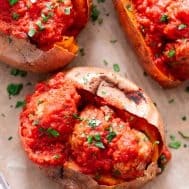 These Italian Meatball Stuffed Sweet Potatoes are flavor packed and easy to make! 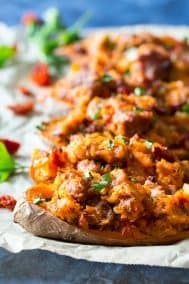 Quick and easy pan fried Italian meatballs are simmered in sauce and served over perfectly baked sweet potatoes for a paleo and Whole30 meal that’s filing and addicting! I realized a few weeks ago that I never actually posted my go-to weeknight meatball recipe. They’re very similar to my slow-cooker Italian meatballs, BUT I make them as fast as can be in a skillet! Weeknights are super busy around here with 3 kids needing to go to after school activities, and, aside from Fridays, I never have more than 30 minutes to get dinner ready. Pus, everyone needs to eat at a different time, so I try to make meals that reheat well. 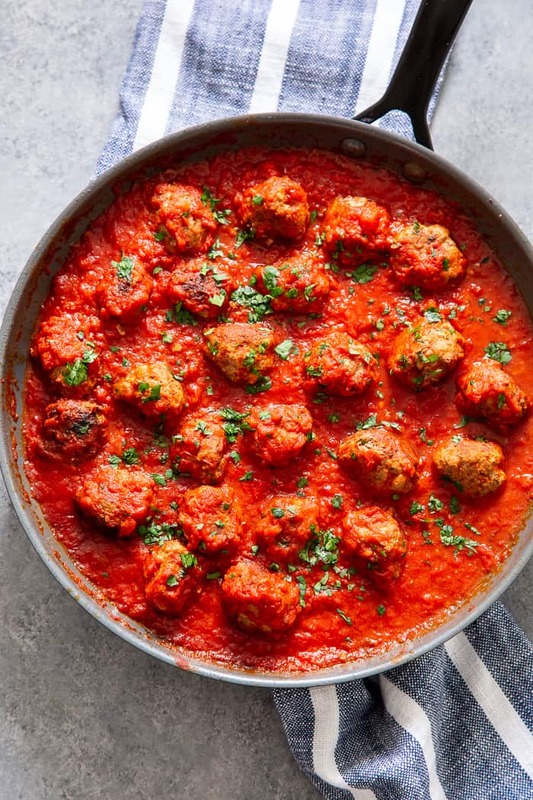 Which is why these meatballs are one of my favorite things to make – they take just about 25 minutes from start to finish and just as good an hour later! For today, I decided to get a little bit more creative than I typically am with my meatballs, though. As you can see, we’re stuffing them into sweet potatoes! It might just not get any better than this – you just wait and see. I’ve always loved the sweet potato/marinara combo. If you haven’t yet tried it, dip a sweet potato fry in marinara and prepare to be wowed. 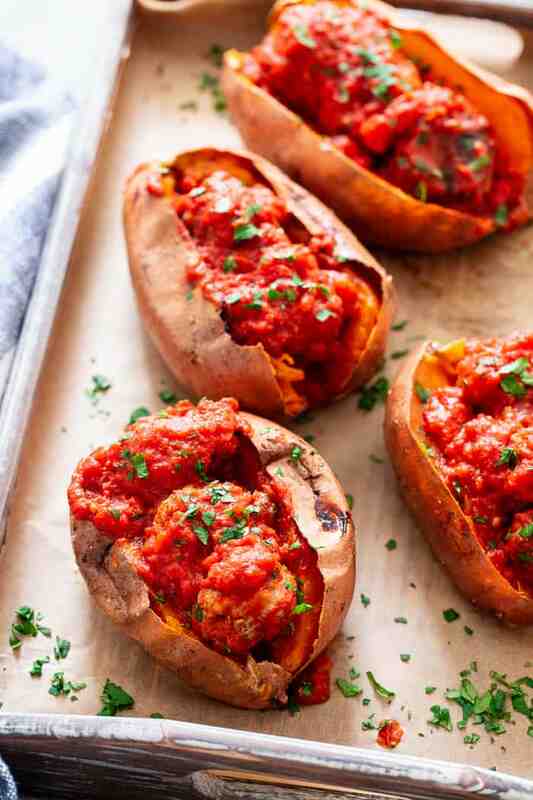 Or, you can just jump ahead and make these meatball stuffed sweet potatoes and you’ll see exactly what I mean. 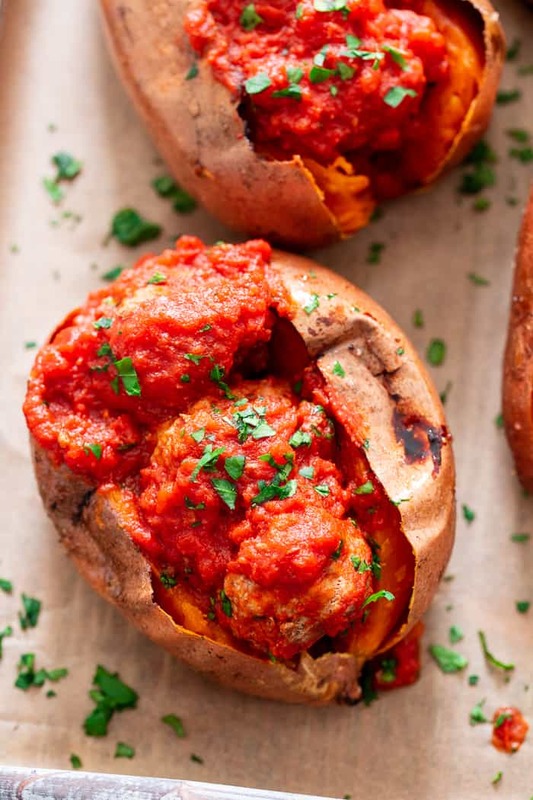 The meatballs themselves are pan fried and then simmered in your favorite marinara sauce. You can obviously make your own (if you’re into that) or just buy a clean store bought version. Rao’s and Cucina Antica are two of my faves. 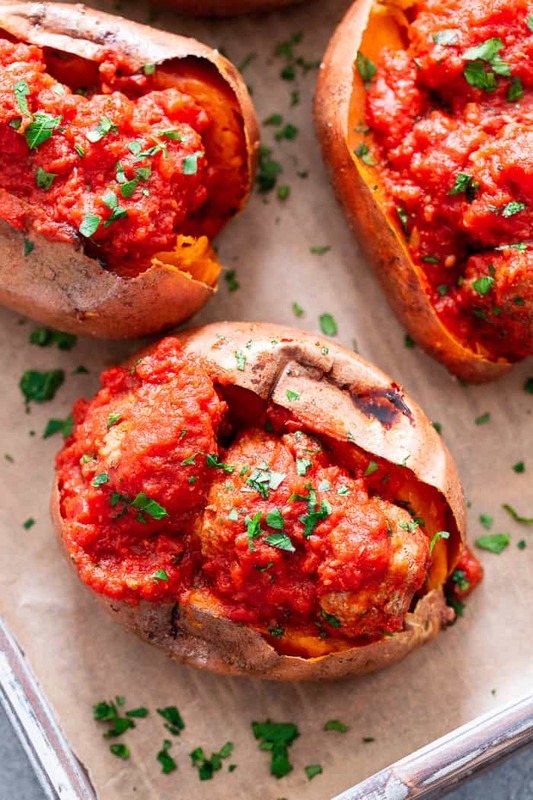 For the sweet potatoes, you can either bake them ahead of time and then simply reheat to serve, or bake them while you cook the meatballs if you have the time. I typically have some already baked in the fridge, and they take just minutes in the oven to reheat. These meatballs are a hit with everyone, including kiddos of course! My kids are more likely to eat them with sweet potato fries than over a baked sweet potato, but to each their own. 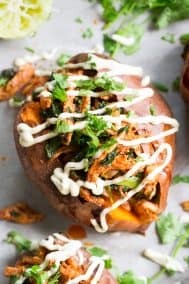 There’s just something about a good stuffed sweet potato that gets me every time, and this combo is seriously tasty! Grab a skillet and bake some sweet potatoes because you are in for a major sweet potato treat – let’s go! Scrub your sweet potatoes and dry well, then rub the outsides lightly with coconut oil and sprinkle with sea salt. Pierce with a fork to let steam out. Meanwhile, make the meatballs. Add the beef and pork (or all beef) to a large mixing bowl along with the egg, almond flour, and seasonings. Mix well will hands, careful not to overwork the meat. Once the fat is heated (if it's smoking lower the heat) begin rolling the mixture into meatballs about 1.5 inches in diameter, and place each one in the pan. Continue until the mixture is used up. Once the bottoms are nicely browned after about 2-3 minutes, flip each meatball over to brown the other side, and carefully turn to brown on all sides. Once browned, add sauce to skillet and bring to a boil. Cover and lower the heat to a simmer. Allow meatballs to simmer in the sauce until cooked through - about 10 minutes. Uncover once cooked through, and allow to gently simmer for 5 more minutes or until potatoes are done. Cut each potato in half and spoon meatballs and sauce inside. Serve right away. If making ahead of time, wait until just before serving before stuffing potatoes. Store leftovers in the refrigerator for up to 4 days. Enjoy! 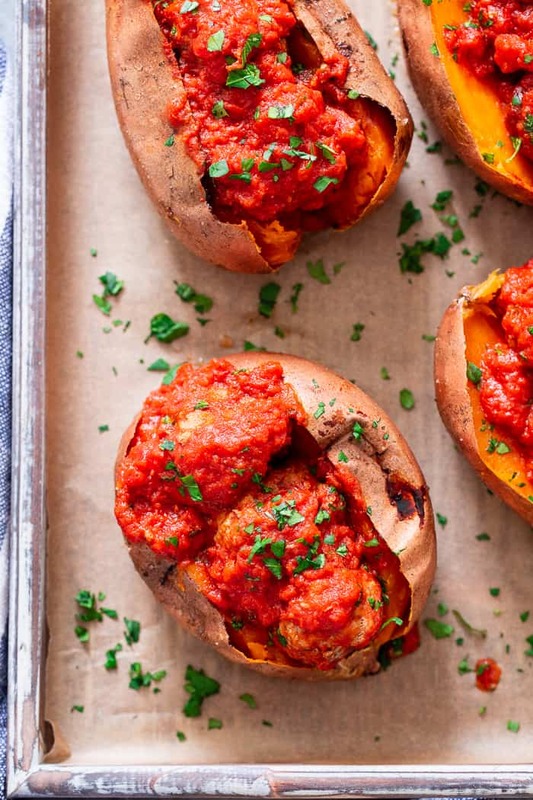 Want More Paleo and Whole30 Stuffed Sweet Potato Recipes? Try One of These! This looks sooo good and so easy! 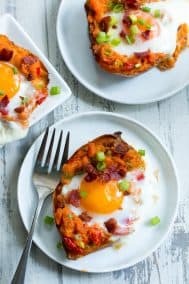 I find myself coming to your blog often because of these type of recipes! I can relate to the busy family weeknights and I appreciate these kind of recipes! I find myself searching for the coveted one-pot and sheet pan recipes often. I wish there were more healthy cookbooks for busy families out there…but for now, I will just keep coming here for your healthy family friendly weeknight recipes! Thank you, Michele! Do you think these meatballs could be baked? Can you use ground turkey or chicken instead? I just used the last of my almond flour on your sandwich bread (LOL), but I’m planning to make these tonight. Can I sub the almond flour for coconut flour without compromising the taste?